This pack focuses on punctuation. 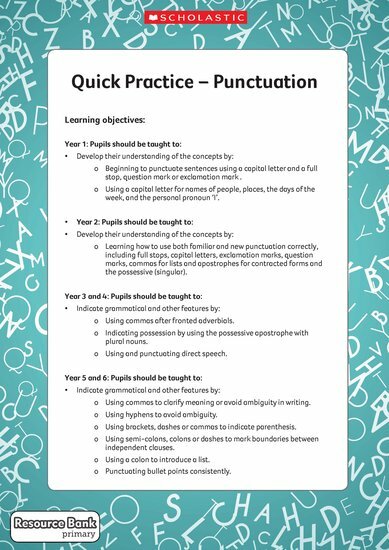 It contains 12 short activities (two for each year group) and a top sheet showing the specific learning objectives from the National Curriculum that are covered by the activities for each year group. Primary members of the Scholastic Resource Bank can “get instant access to this resource sheet”https://resource-bank.scholastic.co.uk/resources/358060and thousands more online resources. Our finely crafted resources include lesson plans, teaching ideas, planning and assessment tools, activity sheets, interactives and video.